We’re now up to 5 straight Best Bet winners as the Blackhawks shutout the Canadiens on Saturday night 2-0 where we were catching half a puck in regulation. Today’s NHL card features 10 games as teams continue to jockey for playoff position. 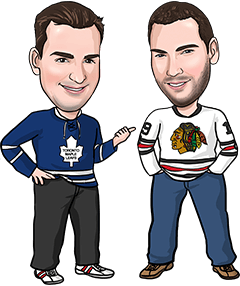 We breakdown today’s Best Bet in the Leafs/Predators tilt and offer opinions on a few other games on the board worth looking to for value. The Leafs have been a great first period team to back in the Mike Babcock era — until recently, at least. Toronto’s gotten off to slow starts a lot more than normal of late, especially at home, where the Buds have been outscored in the opening 20 minutes over the entire season. If there’s still a good spot to back the Leafs in the first period, however, it’s when they’re on the road following a poor performance. When Toronto lost 5-1 at Boston in mid-November, they led the Kings 2-1 after one in their following outing. Following a 6-3 loss in Boston Dec. 8, Toronto led Carolina 1-0 after 20 minutes three days later. Following a 4-0 loss at home to Nashville Jan. 7, Toronto went out on the road three days later and roared out to a 3-0 first-period lead in New Jersey. And now they go into a tough Nashville barn coming off a dreadful 5-2 loss Saturday in Ottawa? We think the Leafs bring a lot of focus and drive to the rink early, something they’ve done all year on the road (outscoring opponents 38-31). Nashville’s been a team we were successful fading a couple of times last week, but the Preds have gained some traction over the past few days with wins in LA and, most notably, San Jose on Saturday. But even when the Preds have been running hot, they’ve been relatively slow out of the gate at home for the past few seasons (this year, they hold a 26-24 edge over visitors in opening frames.) They’re still not scoring a lot of goals right now, and returning home after a 3-game western road trip isn’t an ideal scenario for a host team to come out flying. Catching an underdog price with a motivated Leafs team that has proven a tendency to respond well in this situation is enough to get us to the window here. Bruins at Islanders: An important game for both sides, with Boston trying to stay ahead of the Leafs for home-ice in the first round while the Isles are tied with Washington for top spot in the Metro. When so much is at stake, we think teams tend to play things a little tighter to the vest, something the Islanders are doing a lot these days anyway. New York’s scored two goals or less in regulation in five straight games and seven of nine, but the Islanders have still won 3 of their last 4 because they allowed just five goals during that span. We don’t expect goals to come easy here, but it’s also hard to see any value on the Under 5.5 with -133 juice. Canadiens at Flyers: We faded the Habs Saturday in large part because of their recent scoring slump, and that slump hit a new low when Montreal was blanked 2-0 by Chicago despite outshooting the Hawks 48-24. Having now scored just 11 non-empty-net goals in its last 7 games, Montreal now goes into a rink where it’s lost 18 of its last 22 trips. Philadelphia pulled out a miraculous 2-1 OT win Sunday in Pittsburgh and can move within a point of the Canadiens for ninth in the conference with a win here. Two teams in very different psyches at the moment. Flyers -108 moneyline is tempting, but our favourite play here would be Under 6 -110. Blue Jackets at Flames: The Jackets have thrived in Calgary for nearly a decade (8-0 last 8 meetings), but Columbus is having a tough time winning anywhere on the road at the moment. Columbus has scored just 2 regulation time goals in its last 4 road games, a drastic turnaround for a team with one of the better road marks in the NHL this season (20-12-2). Calgary’s won 12 of 16 at home to improve to 23-7-5 in its own rink this season, and the Flames are coming off a 2-1 loss Saturday in Winnipeg. We like the Under 6.5 -110 here.